JOBPOWER's payroll program is powerful enough to handle the special requirements of construction and flexible enough to allow you to use just the features you need. Since tracking job cost is essential to construction management, JOBPOWER distributes gross pay and hours to jobs. Accurate labor costs are essential for contractors. JOBPOWER will automatically calculate the debits and credits necessary to post to the general ledger. 941 Reporting, ACA Reporting and W-2 forms keep you on track and incompliance with government requirements. Are you required to submit a Certified Payroll Register for a government job? Using the information that you entered when you prepared the payroll, JOBPOWER can print a Certified Payroll Register within minutes of completing the payroll. You may set up a mandated wage scale for a job. When you prepare payroll, the software automatically calculates the pay rate for each employee who worked on that job - even taking fringe benefits into consideration. It also prints the Statement of Compliance for each job. Tired of lost time sheets? JOBPOWER Mobile allows payroll hours and tasks to be entered in the field, then imported into JOBPOWER Payroll quickly, accurately and efficiently. Field employees, their supervisors and office employees may enter their hours, days worked, jobs, cost category codes, work classes, pay types and eliminate the need for someone in the office to key that information into payroll. Alternatively, they can clock-in, pick the job, cost category, work class, and then clock-out when switching tasks or when finished for the day. GPS capture, the ability to enter notes, and the complete integration with JOBPOWER will save time as well as improve accuracy. Click here for more information. Unions have many diverse requirements for calculations and reporting, and JOBPOWER can handle the majority of them. Taxable company contributions and many formats for calculating withholdings and contributions. To find out more about union reporting, contact JOBPOWER Sales with your specific union requirement at 1-800-776-6556. 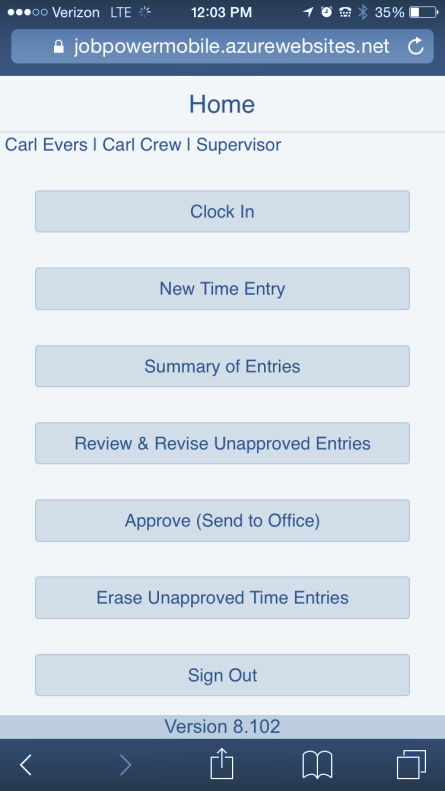 Do you have a timekeeping system for tracking employee hours or are you considering one? If so, JOBPOWER is able to easily import employee hours, jobs, etc., into payroll, saving you countless hours of data entry. You can import the data from systems such as JobClock® by Exaktime, About Time Technologies time clock systems, mJobTime™, or even Excel. The imported data is validated against the JOBPOWER data and verifies employees and jobs. The jobs, days, hours worked and pay type are all imported. You will have more accurate payroll data quicker without any duplicate entry. Employee wages are only the beginning of your true payroll costs. Social security, Medicare, workmen's comp insurance, federal and state unemployment and union contributions all add to the costs that you incur. We call those additional labor costs "burden". The software can calculate "burden" and distribute it to job cost (optional). Seeing the burden on job management reports helps you accurately bill a time and material job, better gauge future estimates, and stay informed of a job's true costs. With JOBPOWER, you can prepare your payroll quickly, easily and accurately. Construction payroll can be very complicated, but JOBPOWER makes it easy. Each time you prepare payroll, the software walks you through entering the necessary information and then does the calculations for you, or you may optionally import from several different timekeeping systems.